Humpback whales come to Hawaii between November and April (whale season), and the Big Island is our favorite of the Hawaiian Islands to go see the whales! Other good islands to go whale watching are Maui and Kauai. Why are we such a big fan of Humpback Whales? and Why do the whales come to Hawaii? The best time for whale watching? Whale season! Where are most whales hanging out? There are many ways to see and hear these majestic animals. You can listen to the whales under water, spot them from the shore, and/or see them from up-close (from a boat). Why are humpback whales so amazing? The immense (on average 45 ft, but lengths up to 60 ft are possible) humpback whales (na kohola) are an endangered species that was brought to the brink of extinction by whale hunters in the last century. Now, thanks to international protection, their numbers are increasing to a current total global population of about 80 thousand humpback whales. Of these, roughly 12 to 18 thousand (2015 estimate, see page 82, D.3.1 and D.4) visit Hawai’i during winter. Whales seem to love playing around in the water, just like us! Despite their size humpback whales are surprisingly acrobatic. They show this by frequently leaping out of the water (which you can see yourself) and by slapping their tails on the water. Humpback whales are also renowned for their beautiful and haunting songs, which, again, you can experience yourself. Humpback whales also have a strong cultural value in Hawaii. To the native Hawaiians a whale is the representation of the Hawaiian god Kanaloa – the god of animals in the ocean. The following trailer filmed partly in the Hawaiian waters you can see an up-close look at how humpback whales communicate, sing, feed, play and take care of their young. Why do the whales come to Hawaii? Humpback whales are a migratory species which means that they migrate every year between the cool waters close to the poles and (sub)tropical waters. Whales belonging to the North pacific (Hawaiian) whale population swim an average of 6000 miles a year, but migrations of 16.000 (!) miles a year have been documented. This makes Humpback Whales one of the best-traveled mammals in the world! Why do the whales come to Hawai’i, you ask? Strangely enough, kind of for the same reason as many of our tourists: to take a break! Humpback Whales spend their summer feeding and building up fat reserves in the cool higher latitude waters and then spend the winter in the tropical waters to mate, give birth, and to raise their calves (children) is a safe environment far away from predators. Because there is very little food for the whales in (sub) tropical oceans they live off their fat reserves during their Hawaiian summer (they fast). The BIG advantage of the warm and food poor waters is that there are not many large predators around that can prey on the young humpback whale calves. It’s like a safe zone! 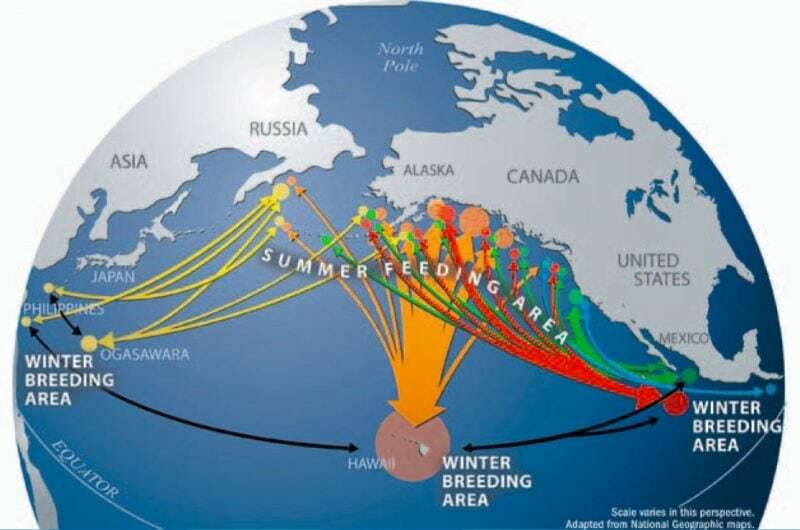 Migration Patterns for north pacific humpback whales. 60% of the population spends their winter around Hawaii! The data for this graph was gathered for the SPLASH (Structures of Populations -Levels of Abundance -Status of Humpbacks) project, image credits: NOAA. Seeing some of the largest animals on earth on their natural habitat is a fantastic experience! Of course, seeing more whales is always better, and we are here to help you with that. Humpback whale season on the Hawaiian islands is between November and Early May. The first whales start arriving to the Big Island in November, and their numbers steadily build up as the season goes on until they peak in the months January, February, and March. The whales leave Hawai’i again late April / early May. The Kohala coast is by far the best place to see humpback whales. Sightings here are sometimes two or three times more frequent than at other locations on the island. 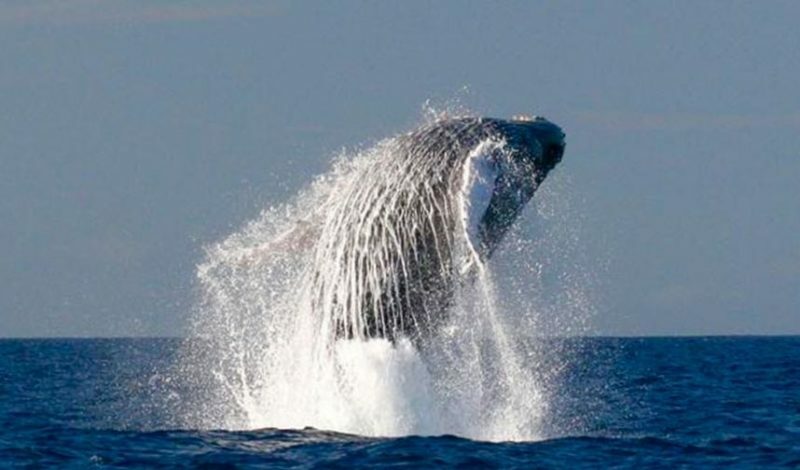 January and February are the best months the see whales at the Kohala coast. In March the total count number halves, but there seem to be slightly more sightings on the Hamakua (northeast) coast. Early in the morning is the best time to see whales. The number of whale sightings on the Big Island at 0800 am is ~50% higher the amount at noon. Average numbers for whale sightings fluctuate a lot! On average over all locations, between 3 and 6 whales were seen per 15-minute period in January and February. However, this average includes some sites with 0 sightings and other with as much as 15-20 whales. You have several options to see and hear the whales while they are in Hawaii: The most popular ones obviously are visiting them up-close with a boat or looking at them from the shore, but did you know that you also can hear the humpback whales sing yourself!? Only male humpback whales sing, and their songs are part of their competition for potential mates. Whales in the same area (which can be as large as an entire ocean basin!) tend to sing similar songs, with only slight variations. Whales from non-overlapping regions sing entirely different songs. These songs evolve constantly (but at varying pace). You can listen to a 13-minute recording of Hawaiian humpback whales singing by playing the audio fragment below. Don’t they sound a bit like cows? Male humpback whales perform these songs often during the mating season, you can perhaps best think of them as flirting! Take a deep breath and swim to the bottom, dig your hands in the sand, or hold onto something under water like a rock (don’t touch the coral!). Listen and hear the whales sing! Take a deep breath of air and dive down to the ocean floor and hold onto something. You will be deep enough when you are at a depth where you can remain with your head under water a few feet without breaking the surface. #4: Where can you best find the whales in Hawaii? An aerial survey for whales, shown below, beautifully shows what are the best places to see whales. Boat tours always take you out to these waters for good reasons, and those people wanting to see whales from the shore would be wise to also follow this map. For the Big Island you will have most chances of seeing whales in the north Kona, and north and south Kohala districts. If you are really passionate about seeing many whales, you can think e.g. about camping in Waipi’o valley, hiking down to Pololu Valley, or having a sunset picnic in Holoholokai Beach Park. Below you can see the results of an aerial survey for whales performed between 1993 and 2003. This map shows where you can best see whales on Hawaii. The red zones are the best spots to see whales. Scroll down for a better description of our 3 favorite on -shore whale watching spots. This map shows where you can best see whales on Hawaii. The red zones are the best spots to see whales, the yellow zones also have whale sightings but relatively less. 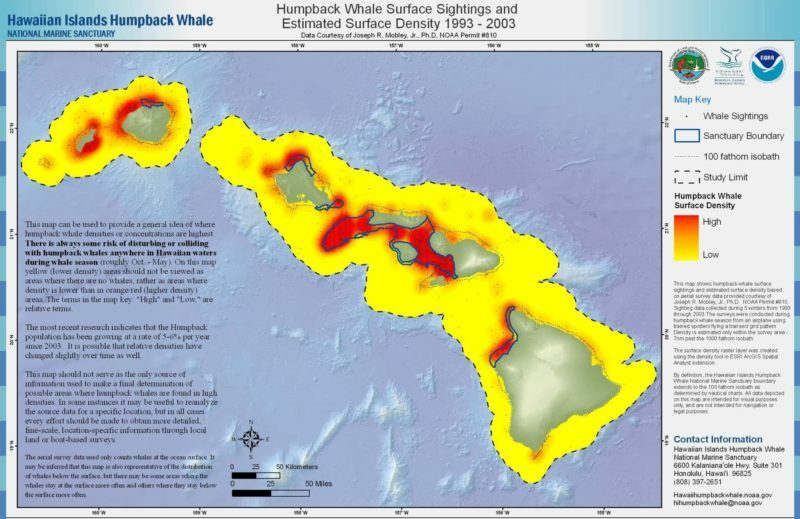 Aerial survey data was collected by Dr. Joe Mobley from UH during 1993 – 2003 and the density surface was developed by the Hawaiian Islands Humpback Whale National Marine Sanctuary. One of the easiest and most spectacular ways to see the whales is to go on a boat tour. Tours allow you to get to see humpback whales from close-by, typically last half a day, and cost about $100 / person. Next to seeing the whales, you could also see dolphins, turtles, and, if you are lucky, a whale shark. 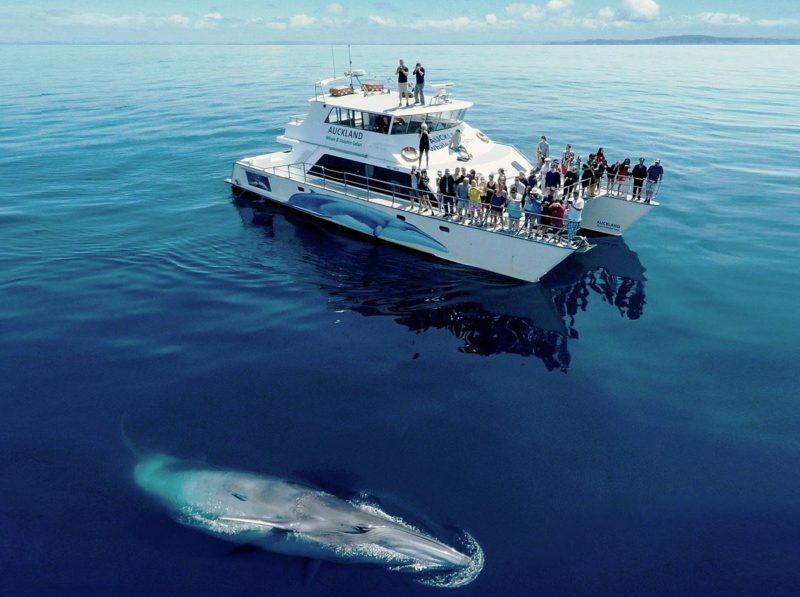 There are many companies that offer whale watching tours on private boats, almost all along the Kona coast. These boats often have a bar on board and they employ professional guides making these several-hour outings a real treat. Whale tours are only offered during whale season, starting typically early to mid December and lasting to the end of March. A household name for good whale watching tours is Body Glove. Make sure to bring your camera and to keep a tight grip on it when taking photos. Read our 6 great whale watching tips to prepare yourself for seeing the whales as well as possible. The thing that most often will attract your attention is a big spout of steam and a bit of water. This spout comes from a whale breathing out and in again and is visible from a large distance. If you keep your eyes on this spot you might get to see more action. In general the best places to see whales from the shore are from the north Kona, Kohala, north Kohala and Hilo coast. 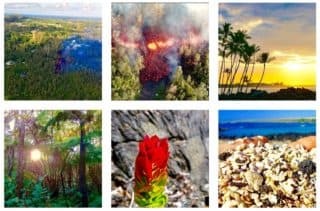 More specifically, 3 very good places to see whales from the shore on the Big Island are: Puukohola Heiau National Historic Site, Lapakahi State Historical Park and Kapa’a Beach Park. You can see where these whale watching spots are on the below, and read more about the spots below the map. Puukohola literally means “hill of the whale” in Hawaiian, which should tell you a thing or two about why we put this park on our list. This is an excellent site to see whales with sweeping and elevated views near Kawaihae Harbor. The Puukohola Heiau site is an interesting place to visit on its own right. It also is located right next to the Spencer Beach park, where there are plenty of picnic tables and a campground. Spencer beach park offers good whale watching conditions through the tables next to the seaside. Image credit: google street view. This park is located on the northeastern tip of the Big Island and is especially apt for whale watching because of its 100 feet elevation. You can find the Lapakahi State Historical Park along Highway 270 north of Kawaihae at mile marker 14. The viewing site is located ~100 yards (90 meters) past the gate at the top of the hill and is ~ half a mile from shore. Tip: this is a hot and sunny place without cover. Bring an umbrella for shade if you have one. There is no cover for the sun in the Lapakahi state historical park. Image credit: google maps. Kapa’a beach park is very close to the Lapakahi state historical park. This site is with an elevation of 20 feet a bit lower than the previous one, but it has one large advantage: covered picnic pavilions! To get here follow Highway 270 traveling north and turn left on the one-lane paved road just past mile marker 16. The viewing site is located at the end of the road. Ocean view and the covered picnic pavilion at the Kapa’a beach park. Image credit: google street view. Have a look at our humpback whale 101 for an identification chart of all possible humpback whale acrobatics such as the breach, the tail slap, the fluke up dive or the head lunge. Did you know that you can combine half a day of whale watching with volunteering if your timing is just right? The Sanctuary Ocean Count project is a humpback whale monitoring project for residents and visitors alike. 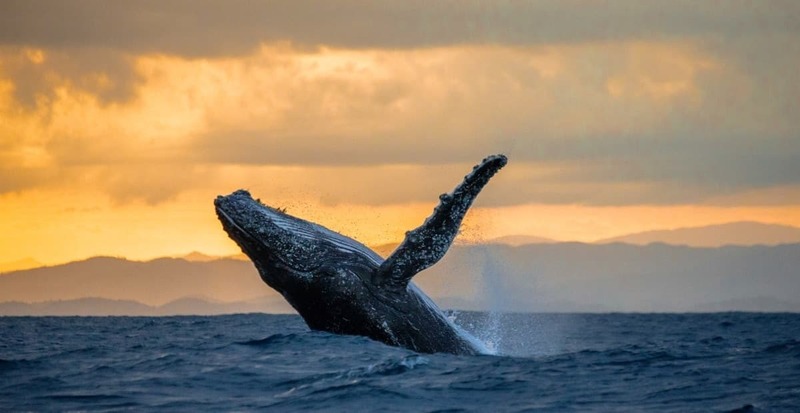 The purpose of the project is to have a yearly shore-based count during the peak breeding season as humpback whales are counted from many locations on the shores of Oʻahu, Hawaiʻi and Kauaʻi. The count is held 3 times a year on the last Saturday of January, February, and March (during peak whale season) of each year from 8:00 a.m. to 12:15 p.m. You need to register ahead of time to participate and can find more information at the Sanctuary ocean count website. Registration for all 3 dates is possible at this website (starting mid December).